Kids' climbing shoes: Strong last for small feet! You should only think about buying kids' climbing shoes if your child's regular shoes already have holes in the toe area. With kid's climbing shoes, motivated and talented young athletes can get a feeling for mountaineering at an early age. Find below some advice for choosing the right kid's climbing shoes. In contrast to climbing shoes for adults, those for kids are barely prestressed and only a few models have an asymmetrical last. This is logical, since the feet of young climbers are not yet fully developed and, with some exceptions, have little experience with higher technical levels of difficulty. Therefore, optimal wearing comfort has top priority. Kids' climbing shoes either come with hook and loop fasteners or bungee cords, so they can be put on and taken off with ease. Thanks to heel tabs, the shoes can be changed easily but please note that not every model comes with these tabs. 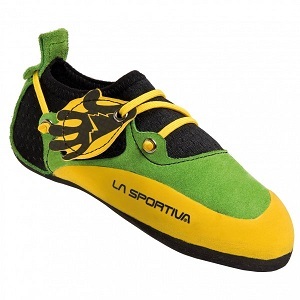 Kids' climbing shoes are available in the European sizes 25 to 36 (US 8 to 16.5, UK 7.5 to 16.5). While adults should always choose the next smaller size, kids' climbing shoes vary significantly in their sizes. In order to choose the right size, customer experience can be quite helpful. The most important thing is: Since a child's feet are still relatively soft, kids' climbing shoes must not fit as tightly as adult's climbing shoes. Also make sure that they don't hurt. If you're not sure about the size, choose bigger shoes as children's feet grow quickly and the main purpose of these shoes is to give your child a feeling for climbing. Some kids climbing shoes come with an adjustment mechanism located at the heel (hook and loop fastening or bungee cord). This allows you to adapt the shoes to the growth of your child's feet.